THIS SPECIAL INCENTIVE DELIVERS THE ULTIMATE FOR LESS. Why blend in when you can stand out? BMW and MINI vehicles are designed to do just that. And with the BMW Group Corporate Sales Program, you can enjoy standing out from the crowd for less than you'd expect. As a member of one of our valued organizations, enjoy a range of incentives when leasing or purchasing a new BMW or MINI vehicle. This program is offered nationwide through your organization and is available to customers that lease or finance their new vehicle through BMW or MINI Financial Services. Customers can also utilize their own source of funding to purchase a new BMW or MINI vehicle. Incentives shown are valid from 04/02/2019 to 04/30/2019 and will update on a monthly basis. *Excludes 2019 M2 Competition, M5, M5 Competition. **FS Retail Finance / Select or Cash Purchase only. *** Incentive not applicable for Oxford Edition models. ****Lease incentive on MINI Cooper S E Countryman All4 includes a $4,000 EV lease credit. All BMW X7 models are not currently eligible for Corporate Sales incentives. Corporate Sales Program Cash Purchase incentives are available to all employees of select organizations that have partnered with BMW USA and MINI USA. Customers can use their own source of funding to purchase a new BMW or MINI vehicle. Corporate Sales Program Lease or Finance incentives are available to employees of select organizations that have partnered with BMW USA and MINI USA and who do not currently own or have not owned a BMW or MINI in the last twelve months. Customers must Finance or Lease the vehicle through BMW Financial Services NA, LLC, including its division MINI Financial Services. All applications are subject to credit approval by BMW or MINI Financial Services. Other offers may be available to employees of these select organizations who are more recent BMW or MINI owners. Employee must provide a current paystub as proof of eligibility. The paystub is used to verify employment with a company participating in the BMW Group Corporate Sales Program. The employee may redact personal information that is not relevant to prove the employment relationship. Provided paystubs will remain with the BMW or MINI dealer for auditing purposes and are not shared with third parties. Available Corporate Sales incentives vary by model or location. Represented incentives shown above may not be available in your location. Please contact your local authorized BMW or MINI dealer for available offers. 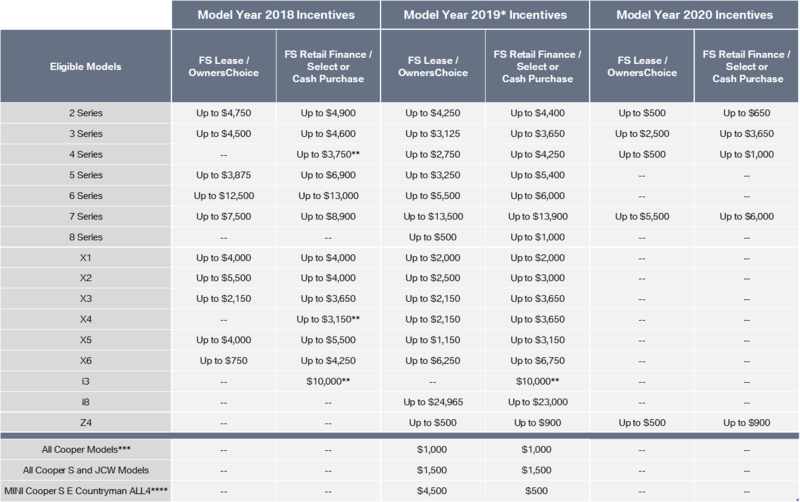 Corporate Sales Program incentives may be combined with most lease or finance offers advertised but may not be combined with other program credits (for example Conquest, Loyalty, Lease, or APR credits). Corporate Sales Program FS Lease / OwnersChoice incentives are not valid in Puerto Rico. BMW Pre-Owned, BMW Company Vehicles, Extended Test Drive, Retired Service Loaners, and previously reported vehicles with 300 or more miles are not eligible with the Cash Purchase incentive. BMW Pre-Owned, BMW Company Vehicles, Extended Test Drive, Retired Service Loaners, and previously reported vehicles with 5,000 or more miles are not eligible with the Lease or Finance incentive. BMW Corporate Sales Program incentive cannot be used in conjunction with Car Club of America (CCA), College Graduate Program, Group Partner & Family Program, European Delivery Program, Diplomatic and Embassy Program, Military Sales Program (USAA), Limousine & Hotel Shuttle Program, and VIP Purchase Program. MINI Next, MINI Company Vehicles, Extended Test Drive, Retired Service Loaner Vehicles, and previously reported vehicles with 300 or more miles are not eligible for Cash Purchase, Lease, or Finance incentive. MINI Corporate Sales Program incentive cannot be used in conjunction with the College Graduate Program, Group Partner & Family Program, Military Sales Program (USAA), and VIP Purchase Program. The Corporate Sales Program incentive is applied toward final MSRP. Specific vehicles are subject to availability and may have to be ordered. Options may be limited due to product availability at time of sale. Incentive amounts are subject to change without notice and should be confirmed with your dealer at the time of transaction. Incentive cannot be applied toward tax, title, registration, destination, handling, or other dealership fees. The Corporate Sales Program incentive must be used at time of lease or finance. In order to receive your incentive, please fill out the form below and you will receive your Corporate Sales Program claim certificate in your inbox in the next few minutes from the email you provided. *One certificate per purchase per year. Certificate cannot be used for multiple purchases. View privacy policies for BMW and MINI. To check out the great line of BMW and MINI vehicles visit www.BMWUSA.com or www.MINIUSA.com.